May is Maker Month. 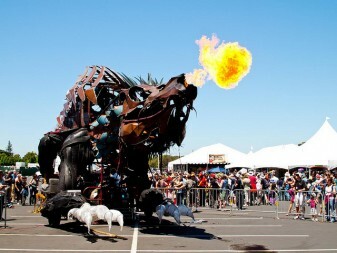 As it draws to a close, the artists, scientists and engineers who call themselves “makers” look back with pride on their creations, many of which were showcased at last weekend’s Maker Faire in San Mateo. The modern maker movement is young; MAKE magazine began in 2005, the Maker Faire in 2006. But the maker urge is as old as humanity, and many modern maker hobbies were once major technological advances: tanning and weaving, brewing and baking, paper-making and printing. One particular pastime, metalworking, was such a powerful force in human history that we named several Ages of Man after key elements. 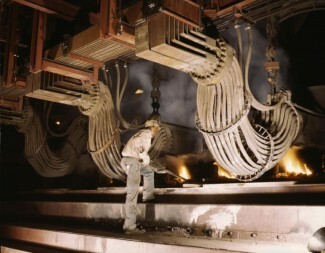 We tend to think of metalworking advances in engineering terms: harder weapons, stronger bridges. 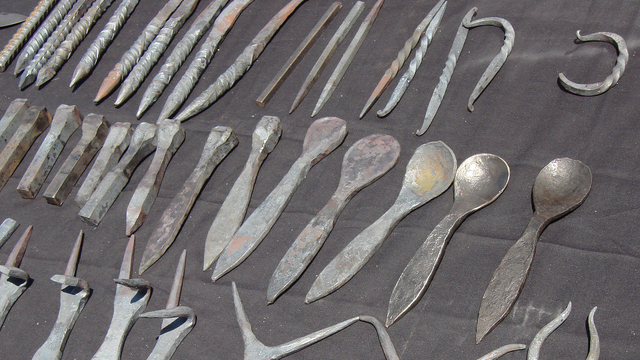 But the very first objects to be built out of metal were not tools, but decorations. Somewhere in the uncatalogued days of prehistory, humans began to make jewelry out of gold. It’s the easiest metal to work–pure gold nuggets need no smelting and are soft enough to work with simple tools. Gold, however, is the only metal that can be found readily in native form (meaning a lump of nothing but gold). Tin and lead, copper and iron–these all occur predominantly as minerals (meaning they’re mixed with oxygen or sulfur or other annoying stuff). In order to get pure metal out of a mineral, you have to smelt it. 1942 smelting furnace. Not the way the ancients did it. Metalworking historians point out that certain aspects of smelting could have been discovered by accident. One day you heat up some rocks in the campfire, and tin or lead flows out. Other rocks, placed in a much hotter pottery kiln, yield copper. And once you’ve got copper, you’ve pretty much got bronze–an alloy of copper and arsenic or tin–because these metals can occur as natural impurities in the copper. Anyway, accidents or no, my hat is fully off to the ancients who figured out how to smelt. These days the metal we use, from pieces of airplane to blades in a blender, is largely worked by factory robots. But human metal makers are alive and well. Like the first metalworkers of prehistory, their work tends toward the artistic rather than the purely functional. If you’re interested in joining their ranks, The Crucible in San Francisco is offering a discount for the rest of Maker Month (that’s tomorrow and Thursday) on all their classes. It did take quite a long time for people to learn to smelt. One thing that has struck me reading about the history of metalworking is that “alloying”, or intentionally mixing more than one metal together (which can often produce a metal with better characteristics than any of the inputs), was a very simple idea that took a long time to be thought of. That’s quite interesting! One thing researching this piece did for me was make me want to spend a whole lot more time researching. You have a good book on the history of stuff like this, don’t you?